President Obama said Monday that he has secured the commitment of several key industry groups to do their part to rein in the growth of health care costs. This pledge from the private sector could reduce the growth in health care spending by 1.5 percentage points a year, for a savings of $2 trillion over 10 years, according to senior administration officials. Overall, it could amount to a 20 percent reduction in the growth of health care spending. 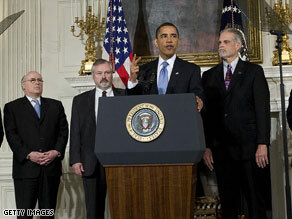 Obama said the pledge is meant to complement his administration’s health care reform initiative. “When it comes to health care spending, we are on an unsustainable course,” Obama said at the White House. “What is a growing crisis for the American people is also becoming an untenable burden for American business. … The explosion in health care costs has put our federal budget on a disastrous path.” Obama’s announcement is aimed in part to reflect lessons learned from the failed health care reform efforts of the 1990s and to get ahead of potential detractors. Watch Obama discuss his solution to rising health care costs » “It is a recognition that the fictional television couple, Harry and Louise, who became the iconic faces of those who opposed health care reform in the ’90s, desperately need health care reform in 2009. And so does America,” Obama said. The 1.5 percent reduction would slow an average growth rate in health-care spending of 7 percent a year, according to the administration. Six major trade associations representing the drug industry, hospitals, insurers, medical device manufacturers, physicians and organized labor have signed on to the cost reduction commitment. The heads of the associations released a letter praising Obama for his “strong commitment to reforming our nation’s health care system” and pledging to work with the administration. The letter states that without any reform, the annual rate of increase in national health care expenditures is projected to average 6.2 percent over the next decade. At that rate, it notes, “the percent of gross domestic product spent on health care would increase from 17.6 percent in 2009 to 20.3 percent in 2018 — higher than any other country in the world.” The industry representatives pledged to develop “consensus proposals to reduce the rate of increase in future health and insurance costs through changes made in all sectors of the health care system.” Among other things, they cited a need to reduce costs tied to chronic disease and obesity. However, the savings promised by the industry leaders depend in part on Congress passing health care reform this year. And it is not clear how these savings would be accomplished. An official who spoke at a background briefing pointed to possible savings from “administrative simplification,” smarter care coordination and changing incentives so providers are rewarded for providing “better” care, as opposed to “more” care. Hospitals are now “financially penalized for providing more efficient care by current law,” the official said. The official also said savings could come from the bundling of payments, in which hospitals, doctors, insurers and other health care companies would work together to bill one fee for one treatment. Calling the commitment “an unprecedented move by this group, some of which have been opposed to reform in the past,” the official said the reduction could mean health-care cost savings of $2,500 for a family of four by the fifth year. The administration is positioning health care reform as critical for getting the deficit under control, for freeing up resources for other initiatives such as education and for reducing the burden on American families. One official described the participation of the private sector as a “game-changer” in the discussion of health care reform. “It makes it even clearer that it’s going to happen this year in Congress,” the official said. A spokesman for AARP, the group representing the retired, responded to news of Monday’s planned announcement by saying, “AARP believes the agreement of providers to slow the skyrocketing cost of health care is critical for the health reform we are all working toward. “Reducing the skyrocketing cost of health care is the only way to create a health care system that works for all Americans; after all, what good is access to a system that we can’t afford” Director of Public Policy John Rother said. Can Congress Make Health-Care Reform Pay for Itself?